Detroit Unleaded exists first and foremost as a much-needed counter-narrative. Yes, America, people still live, work, love, and dream in Detroit. Yes, Arab-Americans who run gas stations can have quirky romantic misadventures like everyone else, while slipping freely between English and Arabic. These should not be new ideas, and yet Rola Nashef’s matter-of-fact debut feature feels fresher than it should. The world of the film unfolds around Sami (EJ Assi), a young man with a meek demeanor. After his father is killed by a robber in the pre-credits sequence, Sami reluctantly agrees to take charge of the family gas station. It’s a dingy 24-hour joint, in one of those off-the-grid parts of Detroit where grass is starting to grow through the pavement, though Sami and his mother (Mary Assel), like most of the area’s real-life Arab community, live in middle-class comfort in nearby Dearborn. 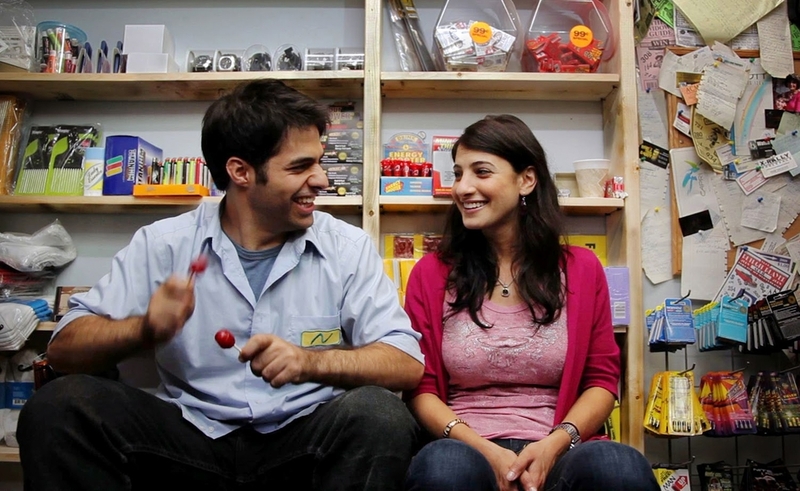 Sami co-owns the station with his fast-talking hustler cousin Mike (Mike Batayeh, who steals the film), who dreams of franchising and loads up the store with bootleg DVDs and slushee machines to compete with an unseen rival across the street. “It’s raining pennies!” an employee yells when the competitors shave a cent off their gas price, so Mike grabs a giant stick and marches outside to change his own rate sign. Tangents like these are everywhere in Detroit Unleaded, and take up far more screen time than the romance that’s intended to be the film’s anchor. Nashef knows how to write good dialogue, and lavishes attention on everyone, from the factory worker who stops in for coffee every night to the twitchy “parking-lot manager” everyone assumes is a crackhead. It’s colorful yet overwhelming, as though Nashef crammed as many characters as possible into the margins to prove the Motor City hasn’t been abandoned. (“Take that, Detropia,” she may well be whispering, with good cause.) When love interest Naj (Nada Shouhayib), a cell-phone sales agent, shows up for the first time, she’s just another customer in a long line; Sami has to invite her into his bulletproof glass cage before she can assume any other role to him, and to the film. Nashef puts a ton of energy onto the screen, though often it feels like that energy is moving in every direction except forward. Thanks in part to frequent montages of Mike’s business dealings, the romance between Sami and Naj doesn’t take focus until 45 minutes in. And though there are wedges to drive between the “up-do girl” and “gas-station guy,” including Naj’s domineering older brother (Steven Soro), every source of tension meets an abrupt, fuzzy resolution. More fascinating are all the ways Nashef finds to play with her setting, using Sami’s bulletproof isolation to illustrate the ever-present yet unspoken fear that violence could claim his life at any minute. Extreme close-ups emphasize the buzzer he must press to unlock his shield for Naj, while the sounds of customers outside the glass come in muffled. He stores a gun behind the counter—not to use, but because he would certainly carry a firearm after what happened to his father. These moments bring an unsettling subtext to what otherwise could have been Arab Clerks. Though Unleaded doesn’t hit the same narrative or stylistic heights as Bilal’s Stand, Sultan Sharrief’s winning 2010 no-budget comedy about a Muslim taxi driver in Detroit, it still has charm to spare. The film’s engine stalls from time to time, but it never dies—much like the city it’s set in.